Saloon settee converts to 3rd double. Presenting in as new condition this very nice powercat was built by Precision Shipwrights to an Albatross Marine design, of composite construction and using only the very best materials, fixtures and fittings, including vinylester & epoxy resins, Awlgrip / Awlcraft SE topcoat finishing, Manship doors and hatches etc. She has approx 3 years of the 5 year hull warranty remaining. Her nearly 5m beam gives a spacious cockpit and a flybridge worthy of a 60' motor yacht, very economical at low speeds she can be pushed along at 29 Knots when needed. 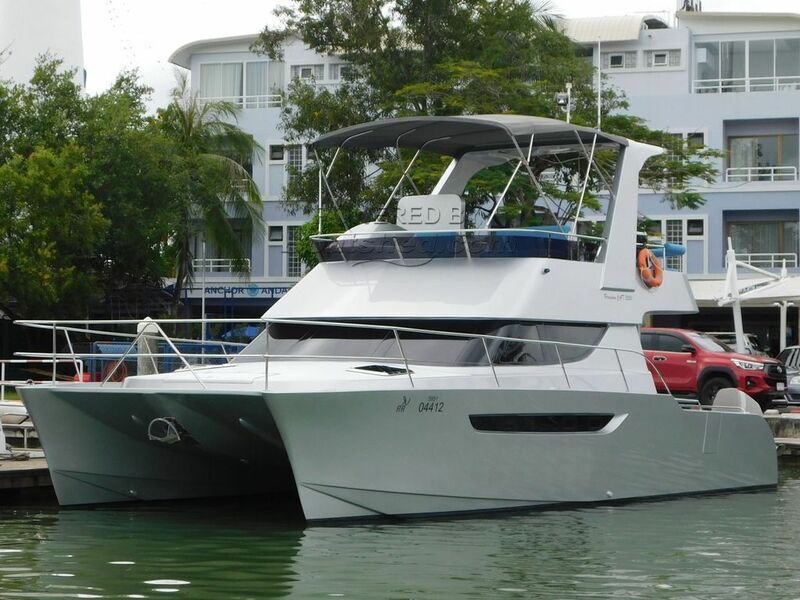 This Precision Cat 3500 Power Cat has been personally photographed and viewed by Alan Giles of Boatshed Phuket. Click here for contact details.